>> anchor: welcome back. at 6:30 tracking a long line of storms and we had damage reports and pockets of rotation develop as well. 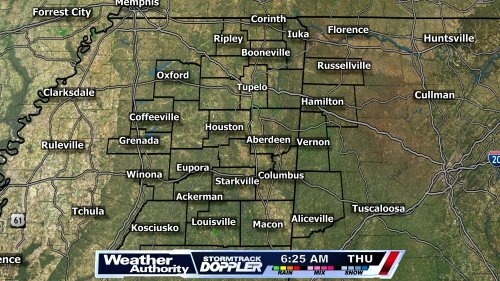 at the moment, 6:30, we don't have any tornado warnings in effect in the wtva news area. there is an area i'm monitoring closely leer to the southeast and making it right now to the edge of the coverage area but in the sugar lock area, cooksville, there is that pocket of rotation i've seen develop a bit more here in the last little bit and we get a new warning out of this and going back in time we'll see a bit more of a kink here at cooksville and that is moving to the north and east towards the alisvilliary and that is over in the franklin part of the county and this part of the storm had history and some damage across much of our area. we go now to morgan who is standing by with an update on where we've seen damage. morgan? >> anchor: thanks. there is a lot going on this morning. we've been in contact with directors across the area and right nought hawkins consolidated school district have not decided when to run the school busses. it was 6:15 but have not given an update yet and stay with us as we continue to follow that. also reports of trees down in several counties. in calhoun, montgomery and 4r50*e7 count sereporting a tree down in the 35u78 oat oatuary and wtva's imma packard is on the way right now to look at that damage and what road conditions are like out there especially where lee county is advising you to stay off of. that is super important as they work to assess the damage on the trace. we have several reports of outages in calhoun city, big creek and the bruce area of calhoun county. 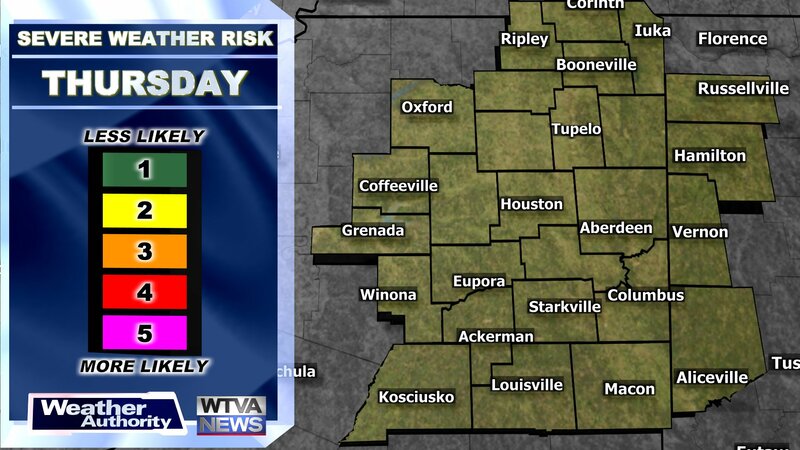 they do have two confirmed residential property damages inical hoon county as well as wind damage in the southern part and we'll continue to follow all of this closely and bring you the latest updates right here on wtva 9 news. joel? repand a lot of the damage was associated with one portion of the line we've been talking about tall morning long and going over where we've seen those damage reports and show you keened of take you in sequence as to how this unfolded. watch this portion of the line through calhoun county to lee county and awamba county and where it is now located in northwest, alabama. you can see on the reflectivity here that circulation and it goes through calhoun county. it doesn't mean there was a touchdown of a tonighter at the time, but at times that area could have had tornado touch downs and several instances this morning where we saw that radar evidence of that. also a bit farther to the south we're tracking that area into the columbus area and that area of rotation weakened a good bit with that history of damage back into the southwestern counties and now turning over to matt with the increase on the updates and the traffic issues we've seen in the area with roads that were blocked. matt? >> we have had some road blockages in the area and wet roadways will probably lead to accidents and the power cam showing all the messiness and grossness and where you're looking at the ponding on the roadways you see that's a lot of stops. also one report of the accident and certainly some weather?related issues and deputies on i?22 eastbund lanes at the county line and according to sheriff dickenson there, reports of at least the accident there and working to find out more information on that and the report of the tree across the roadway and that was occurring from the southwest to flow on the county road 3.63 but i believe the latest update now showing up on live local traffic. in the big take away with the big green swamp and that is all the ponding on the roadway and 0 >> anchor: to northwest alabama and these counties ?? towards the reform and basically for the most part and down to the southeastern parts of the county and still into the far eastern marion county as well going into franklin county so all of this is now moving over into northwest alabama with strong and damaging winds moving through vernon, perhaps at least 40 mph winds and matt is also monitoring this behind the scene and he's our chief meteorologist. pointing out another kink in the line and mentioning that several times and that's ax round ethylsville. so moving up towards shaw ?? around ethelsville and so moving forwards shaw and that is the track it would take to southeastern lamar county and the areas hit before and in the past by hurricane or what was left of harv e. that same area hit hard by tropical tornado. but i think this would be a lot weaker than that. but we'll still monitor it closely. you know, matt, when you were looking at that, i knew as soon auz zoomed in, it's called an inflow notch and more of the warm and moist air is pushed in and that's along 82 and if you plan to do something up 82 from gordo and reform towards columbus and give it a little while and let it pass and it is more likely to produce the isolated sdpoernd we'll check back with not visibility but the velocities on this and may see a bit more strengthening and that's near mill port in 17 minutes so if you live in southeastern lamar county, that warning may not come until after the tornado is developed and watch it closely for you. keep it here for the best coverage and we'll be right back with the update on these storms. >> anchor: at 6:42 the storms are gradually moving out of the area but there are still some not out of the woods and one of the main areas we've been tracking and talking about this is this king in the line with this notch in that line and that's where you can get pockets of rotation. if that develops into an air rotation, it would move towards mill fort in the next 10?15 minutes. kennedy, perhaps in the next 20?25 minutes and then eventually moving into fayette, alabama. not seeing strengthening of that but have seen strengthening of the line itself so, again, anything can happen between now and by the time it is out of lamar and pickins county. further to the south we may see that pocket of rotation perhaps to the north and west of aliceville and been watching this and talking about it a good bit and that is around the highway 32 area of pickins county up towards aliceville and there have been a few little info notches and the look at velocity and there have been a few areas where perhaps we had some sort of rotation trying to develop. in pickinsville it is difficult to pinpoint this and what we're looking at is it is not as clear cut as points in the past and in these areas of the line they get the rotation to develop and don't last long and not easy to point out and like finding a needle in a haystack and watching still with those damage reports and maybe while you're out of the woods in terms of severe threat, there are areas to look at on the roadways. we'll hear more from the wtva reporter emma packer who is live out in the field with updates. >> anchor: at 6:47, a quick recap to show you where the storms are now. at this time the only warning is in franklin and cull vercounty but still in lam parand pickins county and tracking it closely for and you behind that, though the severe threat is pretty much diminishing to the west of the mississippi and alabama state line we are getting reports of damage across much of the area and emma packard, we'll hear from her in just a moment. lite recap the watches still in effect. these areas in blue over mississippi and the golden triangle area and back towards ackerman, those will expire at 7 a.m. and over to northwestern alabama and set to go into effect at 1 p.m. but i expect we'll likely see those drop at some point. now the side note, of course. we have our chief meteorologist here with a picture to share and if we can go to that and show what kind of update he has. >> pull it up on apple tv and this is from amber and this in long view road where a tree is down with numerous trees down and expect more of these pictures over the next couple of hours and the headline is just coming up and expect those roads with lots of trees to have trees down from the storms overnight. be careful. >> and just plan to give yourself extra time. head over to max one here over to my computer and again, that tornado watch going until 1 p.m. want to go through a live look at columbus right now and see that rain still coming down and it's the southeast wind at 9 and that wind calmed down a good bit. the storms moving out by midmorning and maybe sooner than that and still still dealing with the temperatures in the mid60s through the rest of the day. the storm tracker shows the exit of the storms and after that dealing with spotty showers and cloudy skies and that will continue through the overnight tonight ask clearing tomorrow. here's the 7 day forecast and dry on saturday and sunday spotty showers return and more spotty showers byelection day and morgan is here standing by and she'll take us forward to more storm reports. >> we've had lots of damage reported in our area. lots of power outage including calhoun county several counties in lee county and also working to learn more about two trees down where county road 408 and county road 4 in chickasaw and also getting reports of another county with i?22 near the county line. and emma packard has been out in the elements and driving safely but assessing what's around her and we'll go to her now and see what she's seeing. emma? >> i'm here off of palmetto road to the east of the natchez trace and these roads are slick and wet. i've seen people speed by and one person looked like they slid a little bit and then regained control so very important to drive slowly. i was able to drive around on county roads in the area and a lot of branches down and even some that might harm a tire, so, again, it is really important for drivers to take their time this morning and it is slick and there may be stuff out in the roads. trust me. it is worth it to give yourself extra time to head out the door and we'll have road conditions as well as all the weather condition this is morning so be sure to stay with us. reporting live, emma packard, wtva, news today. repand the look at the storm tracker doppler and still franklin county under the severe thunderstorm warning and still rain back behind it so take time on the road and plan extra time met morning commute in case there is a tree down where you have to go and there are also power outages and this is going to delay some folks as you get out the door with you. and don't forget we're with you on wlve and join us for further update on thes storm wes have now and damage reports on where you live. we'll be right back. >> anchor: it's 6:54. columbus on the back side of the areas that are moving out of the region but talk being what to expect going forward for the rest of the day. the live look at highway 85 and 18th street. it's 63° right now in columbus. 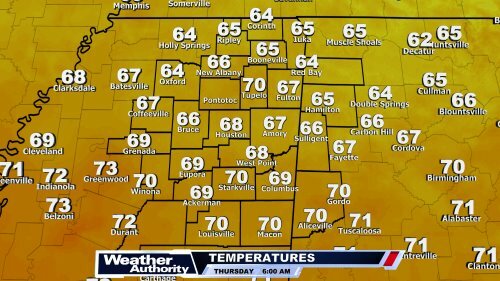 expect those temperatures to pretty much flat line in the 60s all day. the winds from the southeast now, but they switch out of the northwest eventually later in the day and that is marking a cool spell later into the week and we'll keep clouds around with maybe a few spotty showers after lunch, but looks like strong and severe storms cut off probably in the next hour or 2. jump ahead and take a look at the 7 day forecast and we haven't had much to show you that because of the strong storms happening right now. what to expect today and this afternoon we don't get above 68°. friday 57 and much cooler and then into saturday we should be dry with the areas and don't foor get to set the clock back and saturday and sunday and gradually the temperatures climb up to 70 by monday and election day looks like more scattered storms and we'll talk about that in the coming days and look at where we stand with the tracker doppler and storms continuing in eastern marion, lamar and pickins county and then it's to the highway 15 with the severe thunderstorm warning over to eastern franklin county and it is probably going to be here to be expired earlier and this is our meteorologist standing by and i think he has an update. >> meteorologist: we'll shift more and more into damage mode and pictures from and then that big mess and expect delay this is morning for the morning commute and send them in with the wtva weather.